For other uses, see Chain (disambiguation). "🔗" redirects here. For other uses, see Link (disambiguation). Those designed for lifting, such as when used with a hoist; for pulling; or for securing, such as with a bicycle lock, have links that are torus shaped, which make the chain flexible in two dimensions (The fixed third dimension being a chain's length.) Small chains serving as jewellery are a mostly decorative analogue of such types. Two distinct chains can be connected using a quick link, carabiner, or clevis. Lavatory chain, the chain attached to the cistern of an old-fashioned W.C. in which the flushing power is obtained by a gravity feed from above-head height. Although most cisterns no longer work like that, the phrase "pull the chain" is still encountered to mean "flush the toilet". Chains can also be used as a percussion instrument for special effects, such as in Schönberg's Gurre-Lieder and Janáček's From the House of the Dead. 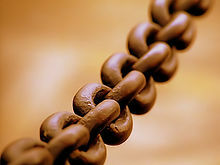 The metal link chain has been in use since at least 225 BC. The prevalent modern symbolism is oppression, due to the use for a mechanical restriction of the liberty of a human or animal. 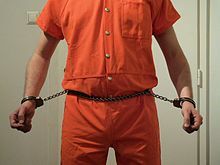 Chains can also symbolize interconnectivity or interdependence. Unicode, in versions 6.x, contains the U+1F517 🔗 LINK SYMBOL, which may show chain link(s). It may also denote a hyperlink. 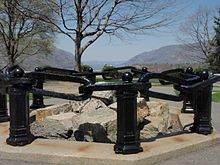 ^ As early as 225 BC, chain was used to draw a bucket of water up from a well. This very early bucket chain was composed of connected metal rings. Tsubakimoto Chain Co., ed. (1997). The Complete Guide to Chain. Kogyo Chosaki Publishing Co., Ltd. p. 240. ISBN 0-9658932-0-0. p. 211. Retrieved 17 May 2006. Wikimedia Commons has media related to Chains. Look up chain in Wiktionary, the free dictionary. "Chain" . Encyclopædia Britannica. 5 (11th ed.). 1911.